Delhi Gate is the western gate of Agra fort, forming its main entrance. Built by Akbar in A.D. 1566, one of his earliest architectural efforts. 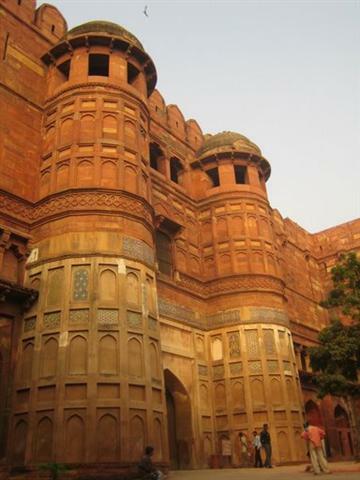 The structure, along with the ramparts flanking it is constructed of red sandstone. The front or outer façade consists of two broad octagonal towers joined by an archway, while the back or inner façade consists of arcaded terraces surmounted by cupolas, kiosks and pinnacles. The gateway is large enough to accommodate a number of large rooms in the interior for guards. Architectural and decorative features such as arcades, arched recesses, patterns in white marble inlay give the structure an attractive appearance from all sides without detracting from its basic purpose as an essential part of the fortifications. One motif, repeated on the borders is a conventional representation of a bird, contrary to the Islamic principle of taboo against representation of animate objects, reflecting the tolerant nature of Akbar’s reign.